If there ever were a perfect jack of all trades laptop, then it would be the ASUS K501UW-AB78 (Now available on Amazon). This laptop is specially designed to deliver the best gaming experience, albeit managing to maintain a sleek design—that is convenient for everyday use. With this laptop, you can watch videos, type documents, prepare spreadsheets, and at the end of the day, delve into serious gaming, playing some of the heaviest games. Here are the specs that make it the ideal everyday computing beast. With an Intel Core i7-6500U Skylake processor, clocked at 2.5GHz (can be overclocked to 3.1GHz on demand), the ASUS K501UW-AB78 is set to deliver high performance. The processor has a 4mb cache, which plays a great role in increasing the processor’s efficiency and speed. The processor is integrated with Intel HD Graphics 520, good for supplementing the processor. Apart from the integrated Intel HD Graphics 520, the ASUS K501UW-AB78 comes loaded with a NVIDIA GeForce GTX 960M gaming graphic card. Nvidia is a renowned graphics card manufacturer, best known for producing some of the best gaming graphics cards in the market. Nvidia’s GeForce family of graphics cards is one of the best in the gaming industry. The graphics card is specially optimized to be economic on the battery while delivering a stunning full HD resolution through DSR (Dynamic Super Resolution) display technology. The laptop uses Nvidia’s Optimus technology to interchange between the GTX 960M and the integrated Intel HD Graphics 520 depending on the application being executed. This results in better battery life. It comes with an FHD (Full High Definition), 1920 by 1080 resolution. The screen measures 15.6 inches, which when coupled with the resolution as mentioned earlier, is perfect for gaming. On the downside, the screen only covers about 45% of the NTSC color gamut, which is standard, to say the least. However, ASUS includes a software feature that mimics an IPS panel, tweaking the display settings to provide rich colors. Included is an eye care mode, that is specially designed to reduce eye fatigue—which is very common when gaming for long hours. The ASUS K501UW-AB78 has 8GB of RAM, which is perfect for any game. 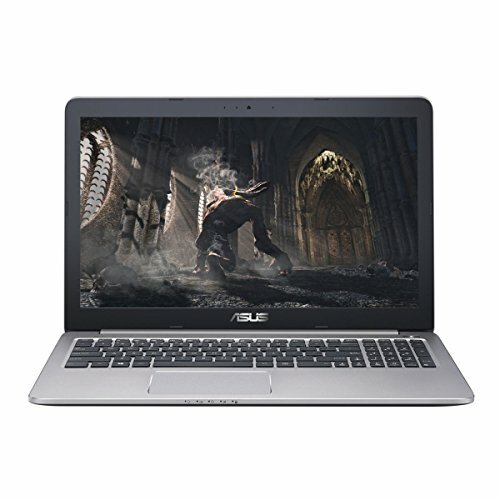 For a gaming laptop, 8GB is standard, a trend that ASUS acknowledges. Apart from gaming, the 8GB of RAM is sufficient to carry out all kinds of tasks. It has an internal SSD storage of 512GB, which is perfect for a laptop. This drive is an M.2 format, which is the new style SSD. It also has a drive bay for an additional 2.5″ drive which can be used to extend the internal memory. ASUS K501UW-AB78 has an integrated ac Wi-Fi card, which is perfect for gaming in that it provides the fastest connection speeds. To fully take advantage of the Wi-Fi card, you might want to invest in a wireless router that supports ac Wi-Fi. It also has inbuilt Bluetooth 4.0, which should be useful for connecting Bluetooth peripherals such as speakers and game controllers. This laptop features some ports that are very useful for a gaming laptop. Here is a summary of all the ports that it comes with. Two USB 2.0 and two USB 3.0 ports. It has a backlit chicklet full keyboard, with a 1.6 mm key travel. This full keyboard is sufficient for fast typing and intuitive gaming, with the backlight making it ideal for use in poorly lit environments. It has a multi-touch pad with support for smart gesture input. The touchpad feels natural to use, and the input is seamless. It has a smart dual fan cooling system. The fans are made of copper, increasing their efficiency by increasing the net heat flow from the GPU and CPU to the cooling system. This ensures that the laptop stays cool while executing huge tasks like gaming. The battery life is not that impressive but okay, getting about 8 hours of minimal use. While gaming at 60 FPS, the 48 Whr battery will last for about 3-4 hours. Watching Netflix or Hulu will last for about 5 hours, which is pragmatic for watching HD videos. It comes integrated with ASUS SonicMaster, a mixture of hardware, software, and tuning—geared toward providing pitch-perfect audio. The ASUS SonicMaster drives huge speakers with specially designed resonance chambers to produce loud and quality sound, which is very impressive for a laptop. It comes with a one-year ASUS Accidental Damage Protection warranty. It has the latest Windows 10 installed, ready to start gaming.